At some point about a year ago, I got really annoyed that I knew almost nothing about Coleman Hawkins except how large he loomed in the history of jazz and how important he was to the development of the tenor saxophone. 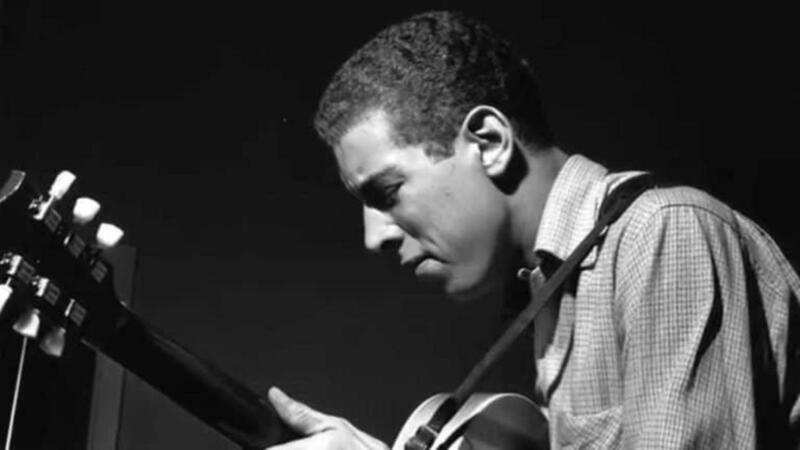 So I went off hunting down recordings and, like a well-intentioned dachshund in a park full of squirrels, was quickly distracted by an album of late-period Hawkins led by Kenny Burrell on guitar. Are you kidding me? And there, on the album Bluesy Burrell – a redundancy if ever there was one – was the slow blues "It's Getting Dark," with the badass double-time turnaround move I've included below. As usual, I've included in parentheses, below the assumed chord progression, the chords the rhythm section is outlining, as well as the scales Burrell is clearly choosing from and how his notes relate to the underlying harmony. This lick falls over bars 7 and 8 of the twelve-bar form, taking you from just after the return from the IV chord around the corner into the ii chord at the top of the third line. The original tune is in Ab but I've put it in Bb here so you can more easily mix and match it with the other licks we've done.